I have such an obsession with the Madame Zingara Group. Every one of their restaurants I have so much love for!Such as the amazing ostrich fillets and deep fried Camembert at Cafe Paradiso and the sticky sweet ribs of the Bombay Bicycle club . Well The Sidewalk Cafe is my most recently tried Madame Zingara restaurant- and I love this one too! The Sidewalk Cafe can be found at 33 Derry Street in Vredehoek. And is as kooky, charming and whimsical as all the others Madame Zingara restaurants. We opted for a large jug of Pimm’s between the three of us which easily made up two big glasses each. Filled with lots of fruit and delicious Pimm’s. My favourite were the huge disks of crunchy sour green apples that were soaked with Pimm’s by the time we got to the bottom of the jug. 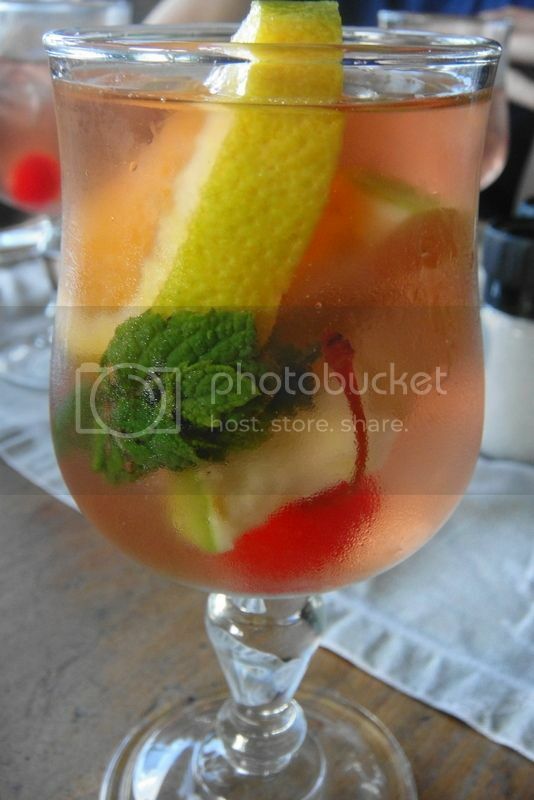 One Pimm’s mistake that everyone seems to make is they forget to crush the mint before adding it to the jug. I got hold of a spoon and did some mint crushing of my own- and then it was just perfect! 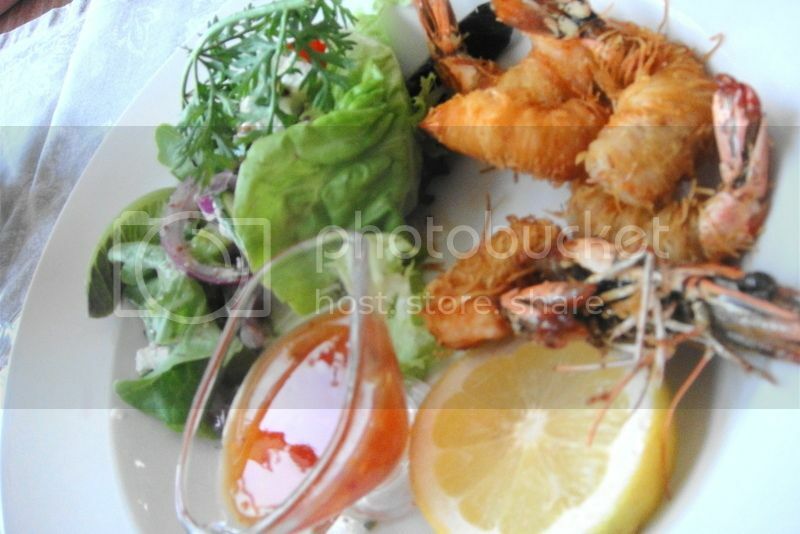 We decided to go slowly with our jug of Pimm’s and ordered this pretty little plate of Ketaifi wrapped prawns for R60 to share. In future I will not be sharing- they were delicious! Ketaifi pastry is a little like a shredded phyllo pastry- very light and crisp. I could have eaten the whole plate on my own! The pastry was crispy and crunchy and was delicious with the sweet prawns and sweet and sour sauce. It seems we were all in the mood for pasta- but out of the three this was the winner of the night! It was delicious! 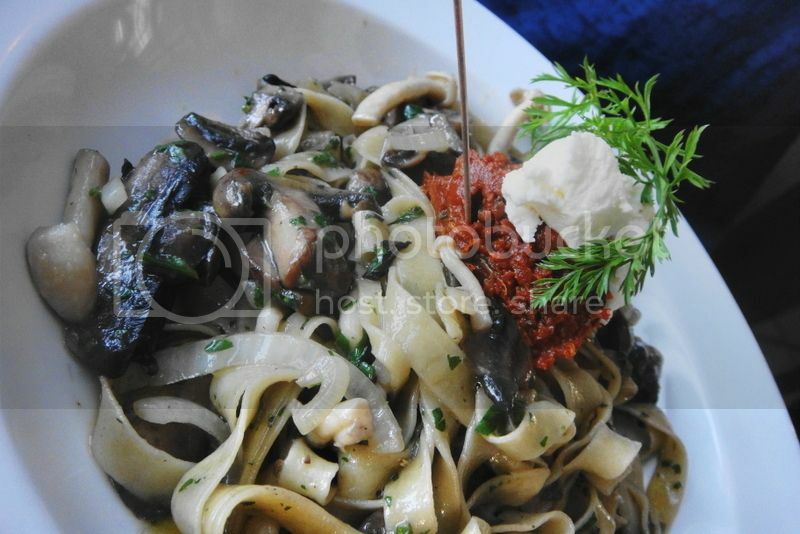 This here is the funghi neri fettuccine with goats cheese and red pesto for R70. This pasta was delicious- I love mushrooms and this pasta had so many different kinds of mushrooms all cooked to perfection. 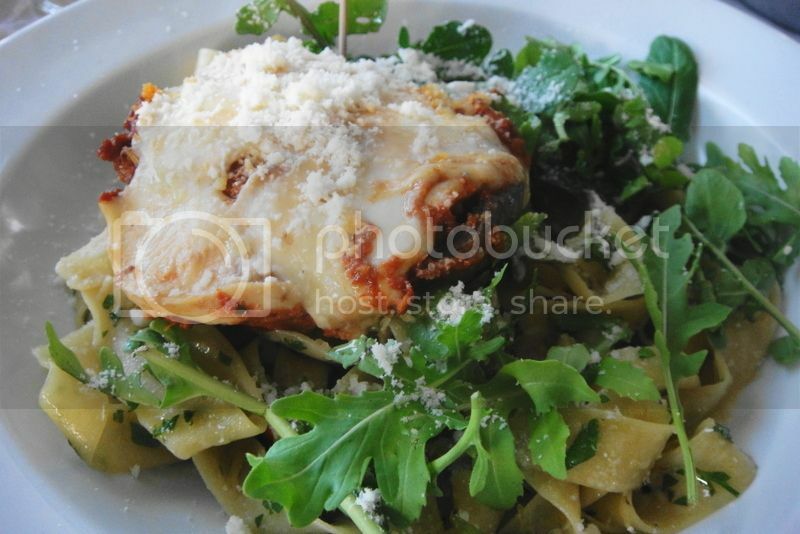 The goats cheese was melted by the heat of the pasta and made it wonderfully creamy and rich. The tomato pesto was the perfect third ingredient as it added a fresh and different flavour. 5 Star pasta- would order this next time! 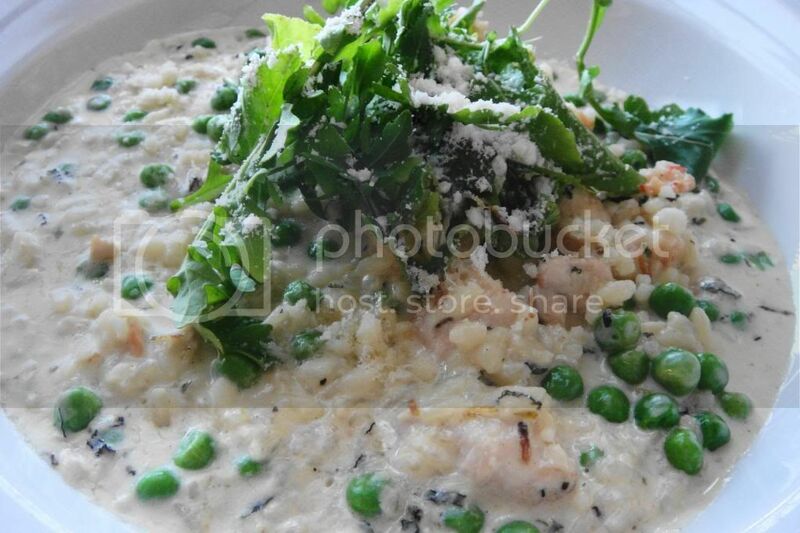 This is the chicken, prawn and green pea risotto for R75. This was tasty and very delicious. The chicken was tender, the prawns were full of flavour and the peas were sweet. This pasta is seriously creamy- and will fill you up quickly! Really wonderful flavours- was a serious contender for first place. I opted for the portobello mushroom stuffed with sun dried tomato pesto and smoked mozzarella served on fresh pappardelle with rocket. I’m so sad to say my dish lost! The portobello mushroom with it’s tomato pesto and smoked mozzarella was wonderful but sadly not enough. Once I had eaten the mushroom with my pasta I was left with a very large bowl of boring fettuccine. It was beautifully cooked pasta but sadly to boring to warrant eating on its own. In future maybe some more tomato pesto is needed or even another mushroom? For dessert we shared this very wonderful, very delicious, very creamy marble FRIDGE cheese cake. I’m not a big fan of baked cheese cake- so was so excited when the charmer waiter told us it was fridge! 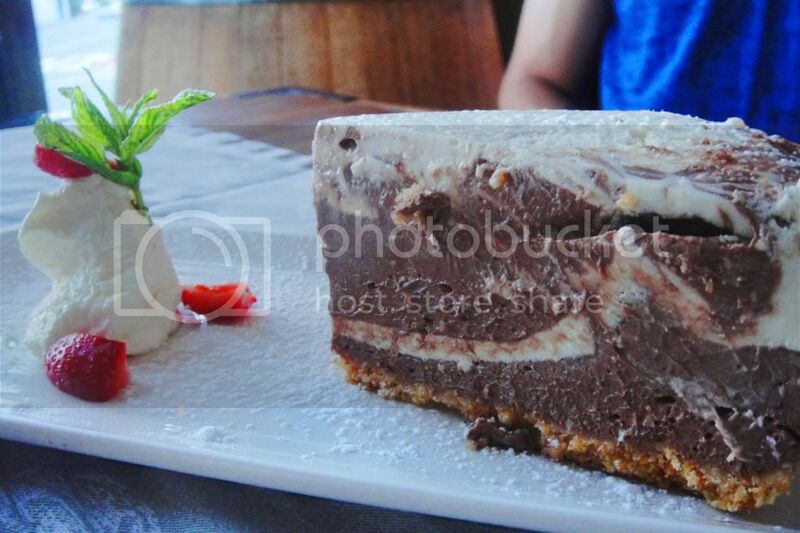 I find most restaurants go the traditional baked cheese cake route and so I never order cheese cake. If you’re a fan of the fridge cheese cake I would highly recommend a visit to The Sidewalk Cafe, If you’re a fan of amazing food, great service and a charming and whimsical venue- I would highly recommend The Sidewalk Cafe. Opening times: Monday to Saturday 8am til 10:30pm and Sunday 9am til 2pm.